Our only compensation is from the clients we serve. This means we are Fee-Only fiduciaries. Our fees are based on the amount of investable assets we manage for our clients. Our fees are 1.0% of the first million and then follow a fee schedule that provides discounted rates for additional assets. Fees are deducted from client assets quarterly in advance, based on their value at the end of the previous quarter after all the transactions have settled. For the full fee schedule, you can see the Our Fees page. There are many ways that we earn our fee, both quantifiable (like designing a customized investment plan, regularly rebalancing to get the bonus, and updating it with a dynamic tilt) and immeasurable (like knowing you have an advisor with your best interests at heart that you can call anytime). First, we are up front and straight forward about our bill. Each quarter in our quarterly reporting we include a clear, itemized receipt showing precisely what was deducted from each account and the total. Some of you may not know how rare this is in the financial industry. For any fee-based advisor, broker-dealer, or salesperson (88% of the financial services professionals), regardless of if they provide an invoice of what they deduct, they have hidden fees that they are charging under the table. We don’t. All our fees are right there on our invoice. Second, we bill the accounts to the client’s greatest benefit. From a tax perspective, there are three main types of accounts: standard taxable brokerage accounts, pre-tax Traditional IRA-types, and post-tax Roth IRA-types. Roth IRAs are post-tax accounts which means that they are never going to be taxed again. The assets are 100% yours. This is the only main type account like this, which is why we are such huge Roth advocates. In contrast, your Traditional IRA is pre-tax which means that all the withdrawals are taxed at ordinary income rates. Thus, even though your account statement says what your Traditional IRA is worth, it will be worth less after taxes. In practice, your traditional IRA is partially earmarked for you and partially for the IRS. If your withdrawals’ effective tax rate will be 30%, then a simple way to think about this is that your traditional IRA is 70% yours and 30% the government’s. Then, there is your taxable brokerage account. Every time a security is sold in a taxable account, if it is worth more at the time of sale than you originally paid for it, the “gain” is taxable. This so-called capital gain is taxable in various tax brackets, ranging from a base of 0% to 20%. There are many ways to avoid the capital gains tax, but most portfolios at some point will need to realize some gains. Furthermore, mutual funds and ETFs will generate taxable dividends, interest, and capital gains by themselves. These are taxed at either ordinary income rates or the capital gains rate depending on their qualified status. These automatically generated taxable investment income are often 3% or less of the portfolio’s value, but you are faced with them every year. And if the portfolio value is increasing, chances are the taxable investment income is as well. When it comes to billing, regulation allows us to bill investment assets using any combination of these three methods. We can deduct the fee prorated across the accounts. We can withdraw any or all account fees from a taxable brokerage account instead. We can invoice the client and ask them to pay with outside assets. Because a Roth IRA is 100% the client’s money and 0% the government’s taxes, billing the Roth actually costs the client more than the other accounts. For this reason, we deduct the portion of a client’s bill due to the Roth IRAs to the taxable account (method 2) or invoice the client if they do not have a taxable account (method 3). For the Traditional IRA, paying the bill with Traditional assets is like getting your marginal tax rate as a discount on the bill. We are billing based on your account value, some of which is the government’s earmarked share. So if you pay the fee out of the IRA (method 1), the government pays their share of the bill. However, if you use either of the other two methods, you are footing the whole bill for your share and the government’s share which means it costs you more. Now, if you are engaging in aggressive Roth conversions, there is a moments pause when you might consider treating the whole Traditional IRA as though it were already a Roth for the purpose of billing. However, in the end this still costs you more. 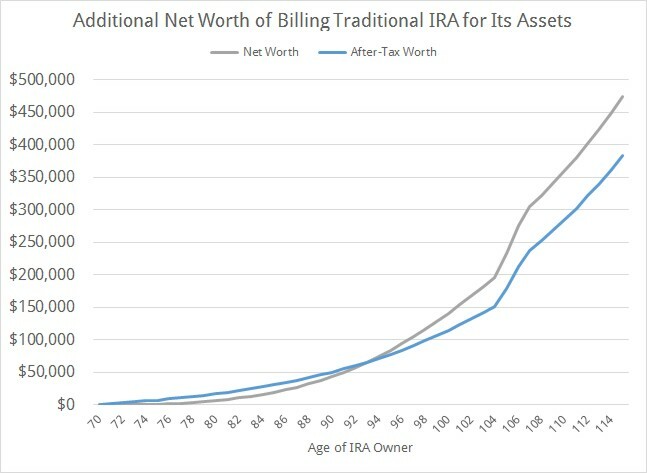 In my example below using a $1M traditional IRA, the after-tax savings of billing the Traditional IRA to itself instead of the taxable account over the retirement of the IRA owner is as high as $383,616 nominal. If only we could pay the whole bill out of the Traditional IRA. Alas, the proportion of the client’s total bill that is assigned to the Traditional IRA cannot be greater than the proportion of the client’s total assets that are in the Traditional IRA. However, at least with this smart billing method you can get this pseudo-discount for some assets.